SYNC Summer Reading Program is Here! 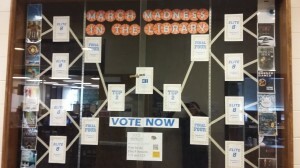 March Madness is coming to the library!! The SoPrep and SoHi libraries will together participate in a March Madness playoff bracket with 16 books in the running. Everyone will receive an email with the link to a VERY short voting form. Our March Madness will follow the dates of the real March Madness. Every 3 days you will get the new link to the recent batch of winners until there is one champion left standing. The Champion will be announced on April 5th. Please take one minute to cast your vote when a new link comes out. For any questions come to the library!